This report profiles major smart grids technology and service providers to the military. It acts as a solid start to planning a military microgrid design and installation, providing case studies of existing military microgrid systems. America’s Defense Department is the largest single global consumer of petroleum, and its military operations comprise the largest demand for all forms of energy. And bases depend on aging transmission systems susceptible to cyber-terrorism and unreliability. A microgrid is a smaller version of the Smart Grid that is localized to a particular area, so its potential use for military functions is vast. Similar to the function of the smart grid, a military microgrid is also expected to improve the energy efficiency and accelerate the integration of various renewable energy resources. According to the Secretary of Defense, 40+ DoD military bases either have operating microgrids, planned microgrids, or have conducted studies of microgrid technologies. 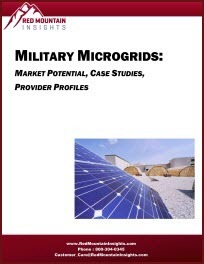 This report analyzes the uses and development of the military microgrids. It begins with an overview microgrids and smart grids. It provides case studies of military installations already using micro smart grids successfully. Companies profiled in this report include: Honeywell International, Lockheed Martin Corporation, Eaton Corp Plc, General Electric, Skybuilt Power, Sturman Industries, Sandia National Laboratories, and ZBB Energy Corporation.